Astro-diagnosis is the science and art of obtaining scientific knowledge regarding disease and its causes shown by the planets. This science of Medical Astrology is slowly permeating the Medical world. 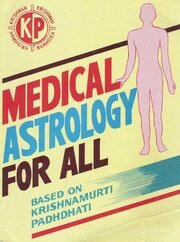 This book on Medical Astrology is one of the best works to the field of Astrology and thus every reader of this book should become a capable astrologer who could diagnose the disease with least effort even without seeing the patient. Where is the necessity for the patient to visit the chamber of the Astrologer? For a Medical Officer, he should see the patient, hear his case, do all the possible tests and arrive at a correct diagnosis. For an Astrologer it is easy to eliminate many of the suspected ones and pitch upon the disease correctly. The book should be more useful to KP students, research scholars and all Astrologers in the world.